Hello Katie Girl: Happy Birthday William Van Winkle! Happy Birthday William Van Winkle! It's William's one year birthday today, and as you can see from the picture below he couldn't be any happier. Donning his conical party hat, he's all set to celebrate! We are throwing him a small party tonight and serving beef Bourbon stew (in honor of his Old Kentucky Home) and giving him a couple of gifts. I am aware of the fact that people who have birthday parties for pets are typically perceived as being insane, but that's fine with me. Even my husband told me that buying a cake candle featuring the number one and these party hats was a little crazy. 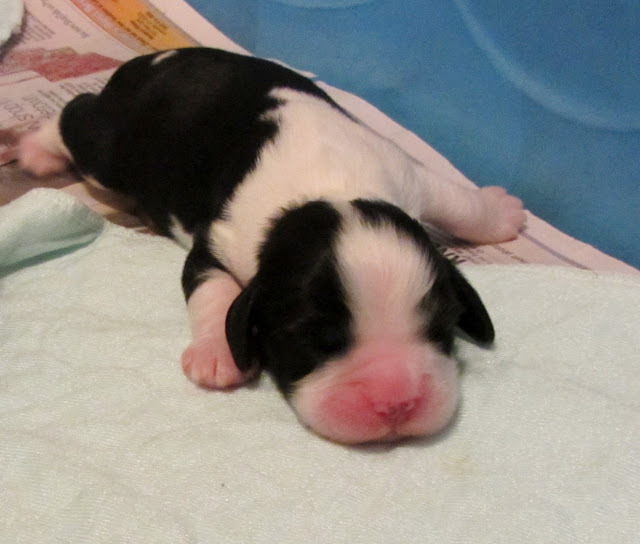 I still remember waking up in the morning one year ago and finding an email from his breeder in Kentucky featuring 8 little new born Springer Spaniel blobs and one tired looking mommy. Yesterday my husband and I looked through all of William's baby (puppy) pictures trying to figure out which one he was, which is still kind of tough. Where in the world is William Van Winkle? I think he is the one in the middle, right next to the liver and white puppy near the bottom. Again, I'm not 100% positive, but I think the picture below is William the day he was born. If it is not William, it is one of his very adorable siblings. It is hard to believe that he was so tinny! 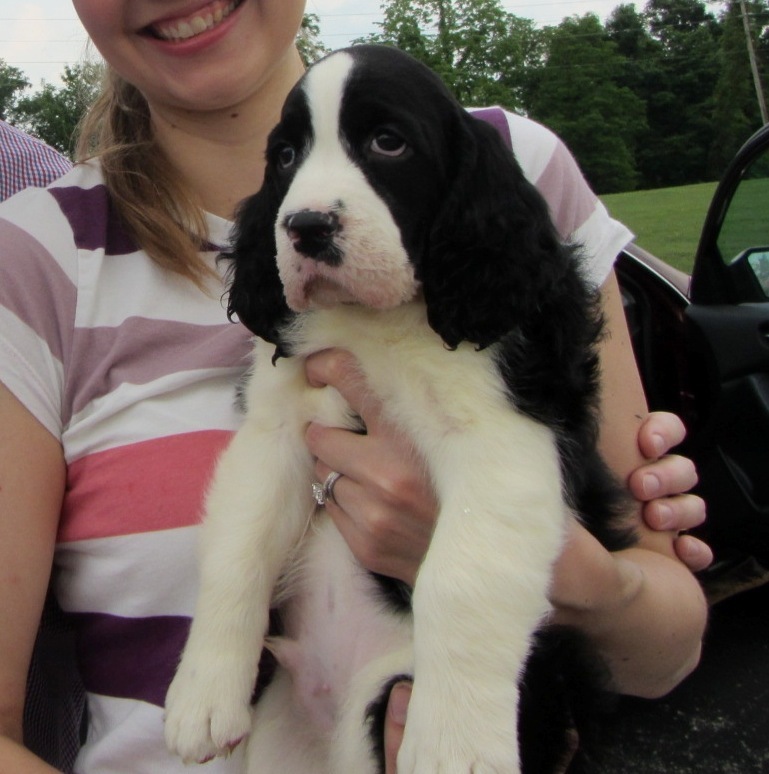 This is William the day we picked him out in Kentucky. At first it was difficult to choose only one from all of the adorable puppies in the litter. With several of these black and white rambunctious puppies running about and tumbling over one another it was like being a lion looking at a herd of zebras; they all start to blend together! Finally we picked William as he was the most devastatingly handsome of all of the very handsome puppies of the litter. I am not sure William knew quite what to think (as you can tell from his expression), especially on the plane ride home. He slept on my husband's lap the whole ride back to California. He's been a great pal ever since and we hope to have many, many more happy healthy years together! Yes, happy 7th birthday! I will pass the warm wishes along to William.